WIN WITH SANSUI SUMMER CUP! 1 lucky reader stands a chance to WIN a hospitality package for two PLUS R2 000 betting vouchers. 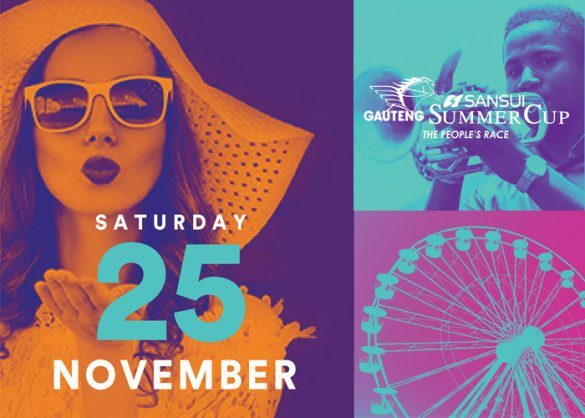 The Gauteng SANSUI Summer Cup is one of the province’s most prestigious annual sporting events, combining the finest in horse racing with a fun, family-oriented day out. While the focus is on the thrilling horse races, the event is packed with entertainment for the whole family. One of the few horse races in the country that children can enjoy, the Gauteng SANSUI Summer Cup offers a fun and secure environment for kids and parents alike. From admiring the beautiful horses in the parade ring and on the track, to experiencing a mind-blowing carnival complete with mechanical rides, face painters, buskers and delicious food offerings, the day promises endless wonder for the little ones. There’s something for everyone at the People’s Race, and you can look forward to a stunning display of fresh South African talent, from roving fashion shows to local bands, a large-scale field band and a wide variety of different hospitality areas, where you can enjoy good food, drinks and music, in style. Competition runs from 20 – 22 November 2017 at midnight. This competition is open to all residents of the Republic of South Africa, who are 18 years or older, except the employees, directors, members, partners, agents or consultants of The Citizen 1978 (Pty) Limited (“The Citizen”), PhumelelaGaming and Leisure Ltd (“Phumelela” and “TAB”), their respective advertising and promotional agencies, media and PR agencies, as well as the immediate family members, consultants, directors and associates of such organisations and persons. A winner must hold a valid South African ID and must over the age of 18. The person accompanying a winner must also be over the age of 18. Any expenses incurred by winner, other than the items listed above, will be for the winners’ own account.